NEW YORK, 20 December 1999 - Even ancient Egypt was once young. Young, and therefore a bit hesitant, sometimes fantastic, tender or even mocking, but already showing the talent of a child prodigy. It is this unexpected Egypt, among others, that was on view at the Grand Palais in Paris last summer before moving on to the Metropolitan Museum of Art in New York until 9 January 2000 and the Royal Museum of Ontario in Toronto from 13 Februrary through 22 May 2000. The exhibition is the result of several decades of fruitful digs at Giza, Saqqara and Meidum, south of Cairo, where the majority of the funerary groupings of the Old Kingdom (2700-2200 BC) can be found. Alongside the work of the archaeologists, recent scholarship has also reexamined earlier notions and allows us to attribute certain works to periods even earlier than had been supposed. The Fourth Dynasty, for example, that of the Pharaohs Khufu, Khafre and Menkaure, has thus reacquired a number of statues and reliefs previously thought to be of a later period. Generally speaking, it is the art of the Old Kingdom, considered by the public at large to consist simply of monumental architecture, that has gained in artistic diversity with more intimate works often touching in their humanity. Paradoxally, no exhibition has previously been devoted to this particular period of Egyptian art. The high quality of the works present, their number (more than 200) and variety, make this exhibition an event not to be missed by anyone who loves ancient Egypt. Even though we have no trace of important political or military machinations, it is impossible to reduce the history of the Old Kingdom to a peaceful succession of forty monarchs incarnating in turn an unchanged royal tradition. The reutilization by the pharaohs of the Sixth Dynasty of bas-reliefs removed from the pyramidal complexes of earlier dynasties shows easily enough that the tombs and temples of the ancient kings were already being pillaged and desecrated two centuries after their construction, and that royal continuity was not so strongly felt that the newly empowered respected or restored the damamged monuments of their glorious ancestors. Two blocks signed by Djoser, builder of the first pyramid (ca. 2690 BC), were thus found in the middle of the pavement of the funeral temple of Queen Ipout (wife of Teti, ca. 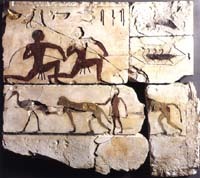 2340 BC) at Saqqara. This recent discovery (1993) may be credited to the team of Zahi Hawass, representative of a young and talented Egyptian archaeology. This is the first time the piece has been shown abroad. It is most likely part of a broken doorjamb, originating in Djosers famous funerary complex at Saqqara. It is probably an element of the oldest stone architecture in the world. The jamb is divided into registers under two identical cartouches that give us one of the names of King Djoser: Netjeri-khet, "holy is his body". A crowned falcon, symbol of the god Horus, surmounts the cartouche. Identical registers alternate below, showing a jackal seated on an invisible prey and a lion at rest. These delicate relief figures have not yet been satisfactorily interpreted. On the sides of the blocks realistic scaled serpents undulate, their tongues sticking out, a motif that we find almost three thousand years later on the lateral faces of the porticos of Sudanese temples. This type of reutilization of older material explains the presence in the ruins of the pyramid of Amenemhat I at Lisht (ca. 1950 BC) of decorated blocks that came from the large funerary complexes of Giza, pillaged and then transmported some 50 kilometers to the south. The preserved fragment, even though we cannot see the composition of the scene in its entirety, allows us to guess the complexity by the curious mixture, barely visible, of extended arms, superposed bodies, tensed bows and arrows in reserve. The exceptional quality of the execution allows us to link this fragment to the best royal reliefs from the period of Khufu and Khafre: the rendering of materials (twisting cords, feathers on the arrows, vitality of the flesh emphasized with ochre) and the delicacy of the chiseled faces are admirable and allow us to assume that the decorative aspect of the funerary complexes at Giza were at the same high level as the architectural rendering, the only one visible today in its original site. We should be grateful to the unscrupulous architects of Amenemhat for preserving a number of examples for us. Egyptian Museum, Cairo It is unlikely that the pyramids of the Sixth Dynasty were decorated on the interior, and the reliefs stolen by the builders of Lisht probably come from nearby funerary temples. We must wait for the end of the Fifth Dynasty and King Unis for the first appearance of the "Pyramid texts", the oldest long composition transcribed in hieroglypics; magic texts linked to the path taken by the soul of the late king. 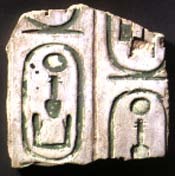 The green color of the drawings is that of the resurrection, associated later with the god Osiris. The fragments shown in the exhibition come from the ruined pyramids of Pepi I and Pepi II at Saqqara, and are dispersed between the Louvre, Brussels, Cambridge and London. 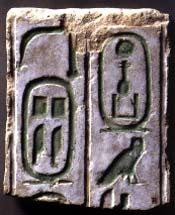 The royal cartouche is easily dstinguished, followed by "this Pepi ", a frequent formulation in magic incantations. An exhaustive publication of these texts, undertaken by the French team at Saqqara and the Egyptologist Bernard Mathieu should soon shed new light on these documents whose content is still obscure and subject to controversy. In 1925, three years after the discovery of the tomb of Tutankhamun, the only royal grave of the Old Kingdom to remain intact was discovered, that of Queen Hetep-heres, mother of Khufu (ca 2600 BC). A mastaba (rectangular funerary edifice) was prepared for her near the pyramid of her husband Snefru at Dahshur, followed by a secondary pyramid to the east of the large pyramid of her son at Giza. 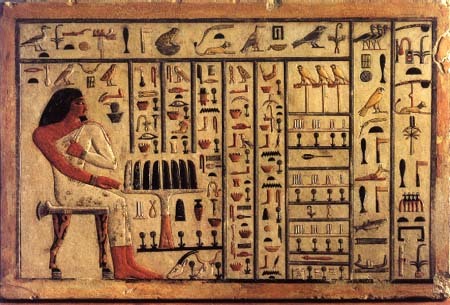 But it was only at the bottom of a well, 27 meters below ground, that her furniture was found, a sedan chair (a copy of which may be seen in the exhibition), and some jewelry, valuable examples of Ancient Egyptian jewelry making, especially twenty precious bracelets presented in a gilded wood screen. These bracelets are also rare because they are of silver. If gold, thought to be the flesh of the gods, was relatively common in Egypt, silver, thought to be the bones of the gods, was rare and valuable. It is only with the New Empire and the development of international commerce that the hierarchy of these two metals was inverted. The decoration of these bracelets is also rare, depicting butterflies, an exceptional motif in Egyptian art. Head, wings and throat, in turquoise and lapis lazuli, all shades of blue and green, brightened up by a touch of red carnelian for the abdomen and the circles that separate the insects. Another son of Snefru, Nefer-maat, was buried with his wife, Itet, in a large mastaba at Meidum. From Itets "chapel" come serveral decorated blocks that are as astonishing for the technical prowess demonstrated as for the scenes depicted. Egyptian art, once a formal mastery had been achieved, here attempts to do even more. The owner moreover proclaims on the walls of the mastaba: "he had these images drawn to be indestructible". In effect, the artist carved deep reliefs, then introduced colored pastes made of pigments mixed with resin. The expected result was the creation of a decor that seems to have been painted on canvas but of which the carving and colors seem to defy the millennia. One block of the mastaba preserves the intact figures of geese of an inestimable quality, but "Geese of Meidum", one of the jewels of the Cairo Museum, alas is not included in the exhibition. Some fragments are shown, however, that have partially retained their original incrustations, as the block from the Ny Carlsberg Glyptotek in Copenhagen. It is obvious that the audacity is not merely one of technique, but also iconographic. A primary level depicts and names two of Nefermaâts sons who are capturing ducks, but there is also a lower level, a humorous scene depicting an ape, a child and another ape following one another in a circle and holding hands. The first primate himself grabs the feathers of a crane apparently embarrassed by such familiarity, but that has kept its plumage and incrustations. It is only in the amarnienne era, a thousand years later, that official or funerary art once again, during the course of a single reign, demonstrates similar humor and freshness. There will always be enough Egyptologists who are as serious as the crane in that image to explain that it is a symbolic representation, but we know that the Egyptians were capable of gratuitous humor, even on the walls of their tombs. The text lists the titles of this high official: Overseer of the Royal Scribes, priest of Seshat, of Heket, of Anubis, among others. This is followed by the list of offerings: bread, beer, meat, fabrics, vases, but also incense, perfumes, makeup, each time followed by the ideogram "thousand", all that was necessary for a prince to maintain his station in the Other World. Much more modest but perhaps more touching are the belongings of the carpenter Inti-shedu. This tomb, discovered at Giza by Zahi Hawass ein 1992, of a craftsman of the Fourth Dyansty yielded four statues representing different periods in his life. These working class effigies demonstrate by the vigor with which they are drawn and the exactness of their execution that the artistic quality of the pharaonic production filtered down through all of Egyptian society. Three of the statues are of the seated artist, holding something (a roller or fabric) in his hand, the fourth is a standing figure, dressed in a simple loincloth and a multicolored gorgerin,the whole topped off by a wig. 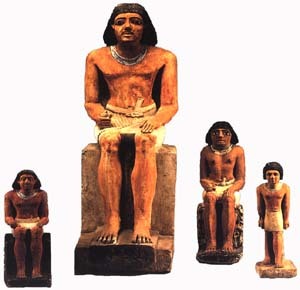 Increasingly broad shoulders and the stronger features and body allow us to follow the models life, from a somewhat soft adolescent (medium seated statue) to the grown man (large statue). The "Overseer of the Boat of of the Goddess Neith, Royal Acquaintance, Inti-shedu" (as indicated by the inscriptions on the bases) probably did not have the time to get any older. He remains the eternal portrait of a man of the people in all his dignity: Egyptian, just a man, since the two words are the same in the language of the Nile. Multi-authored work including 500 superb illustrations, slightly erratic syntheses depending on the author, and extremely practical maps, index and tables. A recent work by two specialists . A recent work, superbly illustrated, about architecture and sculpture. The Art and Architecture of Ancient Egypt by W. Stevenson Smith, revised by William Kelly Simpson: (Yale University Press, Pelican History of Art Third Edition 1998). THE reference work, especially for sculpture during the Old Kingdom. An excellent work analysing daily life and religious concepts in ancient Egypt. An attractive book by the Lila Acheson Wallace Curator in Charge of the Department of Egyptian Art at the Metropolitan Museum of Art and pubished to accompany the exhibition. Ulysse, " le magazine du voyage culturel "
This special issue of a magazine that has long been one of the best includes articles by and interviews with some of the biggest names in Egyptology, but also has an excellent article about Egypt today. Indispensable. A recent work translated from German, offering a rich and original iconography, and first-hand information on digs and research through 1995. Claude Rilly is a professor of classical languages and literature in Paris. He is also an egyptologist and specialist of meroitic language and civilisation. Claude Rilly has contributed on Greek archaeology in GEO (France), and on meroitic phonology in the Göttinger Miszellen (Germany). He is archaeology editor of Culturekiosque.com. Copyright © 1997 - 2002 Culturekiosque Publications Ltd.